Limited Scope Representation: Can You Ethically Provide Better Service at Affordable Cost? Limited scope representation is a relatively new and somewhat controversial idea in the legal profession. Some attorneys are hesitant to provide limited scope representation because they are concerned about the ethical ramifications of entering into an agreement that limits their representation of a client and leaves the untrained client to perform some (or even most) of the duties traditionally reserved for attorneys. Generally, the influx of limited representation has developed due to the growing costs of legal services many people cannot afford. Proponents of limited scope representation believe clients are better off with the limited representation they can afford, as opposed to attempting to face their legal hurdles entirely by themselves. As limited representation becomes more common, attorneys turn to their state bar associations in search of guidance on how to enact this model of legal services.The Kentucky Bar Association has not issued specific guidance on limited scope of representation of unsophisticated clients in areas such as family law or defense of collection activities. Kentucky’s SCR 3.130(1.2)(c) does specifically allow that, “A lawyer may limit the scope of the representation if the limitation is reasonable under the circumstances and the client gives informed consent.” However, paragraphs six and seven of the Supreme Court’s 2009 commentary paint only the broadest outlines of what might be considered a reasonable limitation. For example, paragraph six states that when representing an insured, one’s representation of the insured may be limited to the issue of coverage, leaving the insured to determine appropriate damages on its own. However, may a Kentucky attorney contract only to draft an Answer and conduct initial discovery, but no more? An ethics opinion from 1991, E-343, does give authority to draft only initial pleadings, so long as the attorney does not give the appearance that the claimant is entirely unrepresented, stating, “The overriding consideration should be the recognition and satisfaction of the legal needs of indigent persons. Artificial barriers should not be set up in the name of legal ethics.” In other words, drafting an answer is only ethical so long as the reservations in KBA Opinion E-343 are followed, but if discovery is also drafted, the attorney has entered an ethically gray area. Bearing that in mind, may a Kentucky attorney agree to pursue a divorce by agreement, but cease representation if property settlement is disputed? And if a Kentucky attorney contracts only to represent in pre-trial litigation but not in trial, is withdrawing on the eve of trial unethical? Both the rule and commentary fail to provide the detail necessary to answer these questions. The neighboring bar associations in Tennessee and Indiana have yet to address this issue and do not have information on the issue available on their websites. However, other states in the region, specifically Ohio and Missouri, have addressed the issue to provide guidance to their attorneys on how to competently serve their clients through limited representation, while protecting themselves from potential ethical hurdles that this model of legal representation may present. An article posted on the Ohio Bar Association’s website addresses the issue of limited scope representation, starting with the issue of ethics.When an attorney considers expanding his or her practice to include a new area or new service, one of the first concerns is how to ethically provide this service. Like Kentucky, the Ohio Rules of Professional Conduct do allow limited scope representation, pursuant to Prof. Conduct R. 1.2(c).This rule is an adoption of the Model Rules for Professional Conduct and a similar version of this rule appears in the rules governing attorney conduct in most states. Ohio’s rule allows limited representation of new and existing clients provided the limitation is reasonable and communicated to the client, preferably in writing (although written consent is not required). According to Ohio Judge, Jeffrey Hooper, more than 50 percent of the cases in his court included an unrepresented party. Judge Hooper says it could be a “win/win” if more attorneys adopt the limited scope representation model because that allows clients to receive representation they can afford and attorneys may receive fees for providing this representation. No one is placed in a worse situation by the enactment of limited representation, according to Judge Cooper, if it is done correctly. Negotiating on a client’s behalf. The Ohio State Bar Association’s recommendation list gives much clearer boundaries for what a la carte offerings may be ethically made, which is a boon for both attorneys and judges encountering limited scope representation for the first time. If you want to know more—a lot more—about the ABA’s findings that were adopted by the OSBA, their 149-page Handbook on Limited Scope Legal Assistance on limited scope representation is available online. Of Kentucky’s neighbors, Missouri seems to be at the forefront of enabling its attorneys to provide limited representation, while also providing the guidance to enable them to do it competently and ethically. First, Missouri’s Rule 4-1.2(c) requires agreements to limit representation to be in writing and signed by the client, a brighter line rule than those of Ohio and Kentucky. The Supreme Court of Missouri and the Missouri Bar Association established a commission in 2002 to examine pro se litigation in the state. That committee released a report on limited scope representation that can be of great guidance to Missouri attorneys in implementing limited representation. This report addresses many issues Missouri attorneys face when providing limited scope representation and even provides an example of a limited representation contract for attorneys to use when unbundling their legal services. These are the most affirmative steps taken by a state Supreme Court and bar association to provide its attorneys with the information and resources they need to provide competent limited representation to clients who need it the most. The Missouri Bar Association also provided guidance to attorneys to aid the determination of when limited scope representation is practical and ethical. The Missouri Bar Association advised that attorneys who deal in limited scope representation provide potential clients with questionnaires that will assess that individual’s ability to represent himself or herself to the degree the limited scope representation requires. Further, it set guidelines for the endpoint of limited scope representation, with specific requirements for how an attorney is to withdraw. Finally, Missouri’s Rule of Civil Procedure 55.03 has a more detailed, more explicit list of activities expressly allowed under the rules, giving lawyers more guidance on whether a specific scope of limited representation is permissible. Attorneys in Missouri are expressly permitted: a) to draft documents to be filed in court without signing said documents; b) to appear and withdraw from representation at points of litigation expressly set forth in the contract, without fear of being held over into a trial without hope of payment from the client, and; c) to rely upon the self-represented party’s representation of the facts when drawing up legal documents or performing legal research. Missouri’s Rule 55 serves as a helpful list of dos and don’ts that give clear, logical guidance to attorneys seeking to engage in limited scope representation. We could find no other neighboring state with a better system in place. The legal market, like any other, has an invisible hand. As market pressures such as rising tuition and the rising cost of litigation force attorney’s fees higher, new solutions emerge that resolve disparities between the cost of supplying legal services and the ability to pay by litigants demanding those services. Limited scope representation is the most relevant, prevalent and inevitable of those solutions. It is here to stay. Until the Kentucky Supreme Court modifies SCR 3.130(1.2)(c), or until appellate court rulings interpret how it is applied to the kind of limited scope representation described above, practitioners interested in providing such services should adhere to the ABA Handbook. Since SCR 3.130(1.2) (c) is modeled from the ABA rules of professional conduct), and review the specific programs created in Ohio and Missouri to see if they can adopt similar practices in their local Kentucky courts. By doing so, you should be able to help more people, stay ethically sound and grow your law practice. Can a Lawsuit Settlement or Award Be Taxed By The Federal, Ohio, or Kentucky Governments? You have been injured. You have no idea how you are going to pay for your medical bills. You are not able to work right now because of your injuries, so your family has lost your income and is struggling financially. It is such an overwhelming time that you file a lawsuit, and—great news—you win a settlement large enough to cover all of your medical bills and allow you to provide for your family until you are able to get back to work. However, now you have new worries. You have won this large amount of money—but will the money from your injury settlement be taxed and taken away from you? Does this money constitute income in the eyes of the IRS? The answers to these questions are dependent upon the facts and circumstances of your specific case. Generally, though, the IRS will not interfere with the allocation of funds provided that they are consistent with the substance of the claims in your settlement. Different types of claims are treated differently by the IRS, however, and how you should deal with the settlement money from these different types of claims will be briefly outlined here. If your settlement included multiple claims, the amounts pertaining to each claim will be treated accordingly with the rules for that individual amount. This means that if you receive $50,000 for personal physical injury and $50,000 for emotional distress, $50,000 will be regarded under the rules for personal physical injury or physical sickness and $50,000 will be regarded under the rules for emotional distress or mental anguish. If your settlement is for personal physical injuries or physical sickness and you did not take an itemized deduction for medical expenses related to the injury or sickness in the past, the full amount is non-taxable. You should not include this money in your income reporting. You must, however, include any portion of the settlement that is for medical expenses that you deducted in the past that resulted in a tax benefit. If part of the proceeds is for medical expenses you paid over more than one year, it must be allocated on a “pro rata” basis, or in proportion to the amounts paid each year. Talking to an experienced lawyer at Lawrence & Associates can help you figure out how to calculate the amount to report and fill out the correct forms. If your settlement is for emotional distress or mental anguish originating from a personal physical injury or physical sickness, it is treated in the same way as a settlement for personal physical injury or physical sickness, which is listed above. If the emotional distress or mental anguish settlement you receive does not originate from personal physical injury or physical sickness from the accident, it must be included in your income reporting. This amount reported is reduced by the amount paid for medical expenses attributable to emotional distress or mental anguish not previously reported and by previously deducted medical expenses for emotional distress or mental anguish that did not provide any tax benefit. A lawyer can help you attach a statement showing these deductions to your return and fill out the necessary forms to document this. If you receive your settlement in an employment-related lawsuit, the portion of your proceeds that are for lost wages is taxable and subject to the social security wage base, as well as the social security and Medicare tax rates in effect for the year the settlement is paid. They are subject to employment tax withholding, and a lawyer can help you report these in the appropriate places on your returns. If you run your own business and your settlement is for lost profits for your own trade or business, those proceeds are considered net earnings subject to self-employment tax and must be reported. A lawyer can help you navigate this more complex reporting and help you select the correct IRS forms. If your settlement is for loss in value of property and is less than the adjusted basis of your property, it is not taxable and generally does not need to be reported on your tax return, although you must still reduce your basis in the property by the amount on the settlement. If your property settlement exceeds your basis in the property, the excess is considered income. A lawyer can help you determine if this applies to you and, if so, how much excess you must report. In addition, any interest on any settlement is generally taxable and needs to be reported. Most of the money awarded to you in your settlement is considered compensatory damages, meaning that the money is intended to pay you back for your injuries. Compensatory damages compensate the injured party for their direct suffering (i.e. medical bills, lost wages, resulting health problems, etc. ), and you had to prove that you suffered some type of monetary loss, how much the loss was, and that the other party was the cause of this loss. In contrast, punitive damages are intended to punish the wrongdoer, as well as serve as a warning or lesson to the rest of society. They exceed simple compensation. Punitive damages are only available in cases where the defendant is considered reckless or negligent. For example, in a car accident, punitive damages could be available if the defendant was driving drunk at the time of the crash. Punitive damages are always taxable and must be reported as income, even if they were received in a personal physical injury claim. Some settlements containing punitive damages require the recipient to make estimated tax payments on said settlement. A lawyer can help you determine if this applies to you, and if so, how much your estimated tax payments should be. If you have questions about how your settlement will be taxed, please call Lawrence & Associates today for a free consultation at (859) 371.5997. We’re Working Hard for the Working Class, and we want to help you! Getting into an accident is frightening. You may feel alone and unsure how to proceed after such a terrifying event. Who should you talk to? What should you say? Who is on your side? All these questions may be scattered in your head as you question who you should turn to. The first call you might get is from an insurance adjuster who wants to question you about your accident. At this point, you need an experienced attorney who can help you handle communications with the insurance adjuster to protect your rights. Insurance adjusters for liability insurance policies get annual training on the best ways to interrogate people in car accidents to avoid or minimize damages payable under the policy. Don’t be one of their statistics! Should You Talk To Your Insurance Company After an Accident? The goal of your insurance company is to make the other driver’s insurance pay for damages to the vehicle. Although your insurance company is on your side, they are not paid or trained to pursue your claim against the at-fault driver the same way an attorney will. Your retained attorney will work on your behalf with your insurance company and the other driver’s insurance company to maximize your settlement. This is why it is important after an accident to contact an attorney so your rights can remain protected. In addition, your insurance company has an obligation to pay for related medical bills after a car accident. These payments are called PIP payments in Kentucky, and Med Pay payments in Ohio. However, the adjuster often lives outside the Cincinnati area, and therefore doesn’t have the expertise to help you choose a doctor from the confusing army of medical professionals in the Tri-State area. In a similar vein, many primary care physicians are part of hospital networks that are pressured to refer within the hospital’s network, rather than to the doctor best equipped to treat your injury. One benefit of retaining an attorney early on is that an experienced personal injury attorney knows every doctor in the area, and has seen the outcome of their treatment on hundreds of patients. We know who to refer you to, and take pride in referring to the best medical professional for your condition! Can An Insurance Adjuster Trick You Into Saying Something To Hurt Your Case? The purpose of an insurance adjuster is to investigate and evaluate insurance claims. Adjusters decide whether an insurance company must pay and if so, how much. They conduct interviews, inspect property, and review police reports. 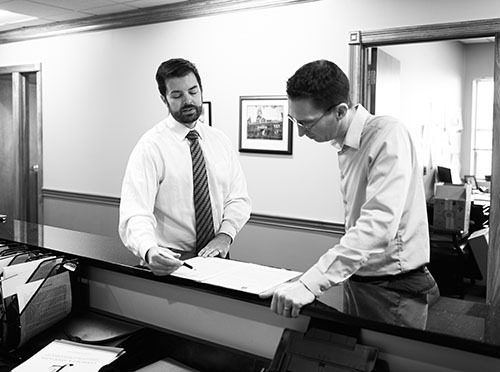 The goal of the adjuster is to obtain valuable information to use during the claims process. While the information may seem reasonable, often any data collected is used against you to lower the value of your claim. There are good reasons to limit your phone conversations with insurance adjusters when an adjuster calls you after an accident. Many adjusters will call frequently in an attempt to get you to settle quickly. In this case, if your injuries are minimal or nonexistent, it is permissible to talk to the other driver’s insurance company. The police report may place liability on the other driver. If this has occurred, communication with the other side may speed the claims process along. Often, insurance adjusters will ask the victim to make a recorded statement. Remember an important rule: you should not provide an insurance company a recorded statement concerning the motor vehicle accident without having an attorney present. Simply put, the other side’s insurance company is not on your side, no matter how friendly or approachable they may seem. You can be completely honest about everything. However, later at trial, the insurance company may attempt to use any inconsistent statements between the recorded statement and the testimony at trial against you. Often, such inconsistent statements occur because your memory will fade between the recorded statement and trial, or because you won’t have known an important fact at the time of the recorded statement that you later learn before trial. Despite such reasonable explanations, the lawyer representing the insurance company many attempt to use this contradiction to make the jury question your credibility so that the jury will find for the defendant and not the victim. Having adequate representation will help prevent you from accidentally saying the wrong thing, or speaking about facts that haven’t been adequately investigated. In addition to attempting to extract information to use against the victim and to get a recorded statement, the insurance company may also try to get the victim to sign a medical release form. These medical release forms allow an adjuster to get all of your medical records from every provider you have ever had. That is an enormous invasion of your privacy, and unjustified by any provision of Kentucky or Ohio law! It is important to keep the goal of an adjuster in the back of your head. They are there to reduce or eliminate your claim and protect their profits. If you provide recorded statements or sign medical releases prior to consulting with an attorney, there is a high chance that your claim will be significantly decreased. How Can I Protect Myself If an Adjuster Wants to Take My Recorded Statement? Individuals who have been injured in an automotive accident cases may choose to consult with personal injury lawyer. If you are seriously injured in an accident you should consult an attorney. An attorney can also help you if your own insurance company denies payment of your PIP or Med Pay benefits. Here at Lawrence & Associates we can handle the process of communicating with insurance companies so that you will not make a mistake that will negatively impact your case. We will handle the proper negotiations with the insurance company in order to pursue just compensation. If there’s even a small chance you could have significant injuries or damages, or the question of who caused the accident is in dispute, it’s probably smart to not speak with the other driver’s insurance company without legal representation. Call our attorneys today for a free, confidential consultation if you need help. We’re Working Hard for the Working Class, and we want to help you! How Can a Local, Cincinnati Attorney Help Get Social Security Disability Approved? Social security disability attorneys can help make an overwhelming process seem much more manageable. While hiring a lawyer specializing in social security disability cases is not required, it will likely be extremely beneficial during a difficult time when your health is suffering. Social security disability attorneys have experience dealing with the Social Security Administration (SSA) and, as such, will be able to handle any of the various issues that could arise during the application process. You can expect your social security disability benefits attorney to review your case with you and ask you a variety of questions, both to gather information on your case and to prepare you for questions you may be asked should a hearing be necessary in the future. Your social security disability attorney will function as the liaison and communicator between you and the SSA. This is just one of the duties that you can expect your social security disability attorney to carry out on your behalf. But it is an important one, as the language and application process of social security disability is complex and often foreign to the average person. At Lawrence & Associates, Kelsey Westermeyer handles the vast majority of social security claims and consistently achieves high approval ratings. How Can My Attorney Help Get Approval for SSDI Through the Cincinnati, Ohio or Florence, Kentucky Social Security Offices? Another one of the duties of your social security disability attorney is to complete an initial review of your case. This will happen no matter at which stage of the application process you are. After this initial review, your social security disability attorney will determine the best strategy for you moving forward. He or she will assist you in crafting a compelling story around your case and develop some strategies for how your case will be won. One of the most common (and significant!) mistakes made by individuals applying for social security disability benefits is filing with an incomplete claim. The majority of applicants for social security disability benefits are denied during the initial stages, mostly due to incomplete applications. Having your social security disability attorney review your application and ensure its completeness is one of the best ways to ensure your application will go undo review in the proper channels. Your social security disability attorney will collect and sort medical evidence on your behalf. Many social security disability cases are won and lost on medical evidence. After obtaining proper medical release forms, your social security disability attorney will help you gather the relevant medical evidence needed for your application. He or she will review your medical records and work alongside you to collect any missing medical information or tests. Most importantly, he or she will sort through the hundreds of pages of medical documents to determine which information is the most important. Many social security disability attorneys will work directly with your medical provider, physician, or other healthcare provider to gather supportive opinion statements and letters. Having this evidence strengthens your case and makes it more likely that you will be granted social security disability benefits. Additionally, if your social security disability attorney determines that additional testing is necessary to bolster your application, he or she can request a consultative examination from the Social Security Administration doctors or ask that you get the additional testing completed on your own. Your social security disability attorney is responsible for staying in communication with the Social Security Administration. The Social Security office is enormous and has an immense volume of claims pass through it. The application process of social security disability benefits is complex, filled with multiple deadlines and various formalities that must be adhered to. Your social security disability attorney will communicate directly with the SSA on your behalf, so that you have less to worry about regarding your application and more time to work on your health. Having a middleman communicate with the SSA on your behalf protects your best interests during this already stressful time. Your social security disability attorney will work to push your social security disability benefits application through the system with minimum effort and work from you. How Can My Attorney Help Represent Me in Front of a Social Security Administrative Law Judge at a Hearing? If needed, your social security disability attorney will file the necessary appeals for you. According to the Social Security Administration, less than forty percent of social security disability applications are approved at the initial application level. If your case is one that receives an initial denial, you are entitled to appeal the decision. The appeals process contains several specific and distinct steps that much each be completed within a certain amount of time. Hiring and retaining a social security disability attorney can help you navigate the appeals process, should your initial application be denied. To that end, your social security disability attorney will represent you at disability hearings, if necessary. The majority of successful disability claims are won at the hearing level. If you are originally denied disability benefits and you and your attorney appeal the decision, you are offered a hearing in front of an administrative law judge. The hearing process is stressful, and having adequate preparation is critical to your success. Having a social security disability attorney will ensure that you are adequately prepared for your hearing. Though you will still need to speak for yourself, your social security disability attorney will represent you during the process and prepare you to testify. Your social security disability attorney will ask questions of your witnesses and address any expert witnesses, such as medical or vocational experts. If you have already been granted social security disability benefits but feel that you are not receiving adequate compensation, your social security disability attorney can help you request additional financial aid in the form of SSI benefits. Your chances of success when applying for social security disability benefits dramatically improve if you are working with a social security disability attorney. Even if you are struggling financially due to your illness, hiring and working with a social security disability benefits attorney is well worth your time, energy, and money when you consider that without their help, winning your case can be exponentially more difficult. If you are overwhelmed by the social security disability benefits application process and would like some assistance from qualified, experienced individuals, contact Lawrence & Associates today. We can help you obtain that fresh start that you deserve! Call today for a free consultation at (859) 371.5997. We’re Working Hard for the Working Class, and we want to help you! This comment never fails to amaze me. There isn’t a kind of person that sues people. Personal injury lawyers don’t get repeat customers. On the rare occasion that I have seen the same person back in my office, I don’t think I’ve ever seen more than two lawsuits. But more than that, “I’m not the kind of person that normally sues people” speaks to a kind of shame associated with the civil justice system. “I’m not the kind of person that normally sues people” means that nearly everyone who walks into my office thinks only bad people sue other people. We all know that doesn’t hold water. We’ve all driven past accidents where the ambulance is already removing a driver that was rear ended or t-boned; do we really believe the guy in the ambulance is a bad person for suing the one who put him there? But really, the ridiculousness of “I’m not the kind of person that normally sues people” goes deeper than that. There are a lot of reasons that lawsuits are good things, so long as they are handled by good lawyers. That so many people don’t understand that speaks to a long history of disinformation about the civil justice system, including things like the myth of the McDonald’s Hot Coffee and a series of widely believed email forwards from the early 1990s. When you set aside falsehoods and think about it, there are many reasons you should file a personal injury lawsuit if someone else hurts you. There is a reason the founding fathers of every state, and of the federal government, made sure to enshrine the jury trial system: it provides for a peaceful resolution of conflicts while making sure the wrongdoer – the one that hurts, the one that takes, the one that breaks – is brought to justice. Prior to the jury trial system, it was common for people to fight duels, or for might to make right. Today, lawsuits are common and duels don’t exist. No one dies over defamation, or for being an inattentive driver. And no one should get away with it either. The beauty of the lawsuit is that it brings peaceful justice for men and women that have been wronged. Without it, we’d be back to the kind of 18th century justice our forefathers fought to prevent. That was all well and good for the 1700s, you might say, but does it really apply today? Yes, and even more so than it did when the Constitution was written. Back then, a defendant losing a lawsuit might have to pay a princely sum of money; maybe enough to have to mortgage the family farm, or lose a business. Today, that fear doesn’t apply because almost everyone and everything is insured. The most familiar form of insurance is auto insurance, which all Americans are required by law to get, but it isn’t the only kind. There is property insurance, general liability insurance, homeowner’s policies, farmowner’s policies, malpractice insurance, umbrella policies; you name it, and the insurance industry already thought of it thirty years ago. All those insurance policies not only mean that no one has to sell their house because they lost a lawsuit, but they also change the very nature of filing a lawsuit. Let’s take automobile insurance as an example. An insurance policy is a contract. The insurance company says they will cover a driver for a specific amount of money if he or she causes an accident, and in exchange they want a certain amount each month as a premium. Let’s say that driver pays the premiums, and a few months down the line, rear ends you while you’re driving your car. You’re taken away by ambulance, and later file a lawsuit to cover your medical bills and the wages you missed while being off work. When you file that lawsuit, you aren’t saying you want the other driver to pay you. You’re saying you want the insurance company to honor its contract. The money doesn’t come from the other driver’s pocket. It comes from the insurance company. The insurance company took the premiums, and they are supposed to pay for the damages. The lawsuit only happens if they don’t honor their contractual obligations. Feeling guilty for forcing an automobile insurance company to honor its contractual obligations makes no more sense that feeling guiling for forcing your health insurance company to pay for medical bills. It’s worth bringing up another common myth about lawsuits: the money doesn’t really all go to the injured person. Yes, they take some home and yes, the attorney gets paid. But most people don’t realize that doctors often receive money as a result of a successful Workers’ Compensation lawsuit by an injured person against an insurance company. Also, every successful lawsuit against an automobile insurance company like Statefarm means a health insurance company like Humana gets reimbursed for the bills they paid. The logic is simple: one person or company caused the harm, and that person or company should pay for the harm. A doctor should not bear the burden of medical bills that cannot be paid, any more than the injured man or woman should bear the burden of being unable to put food on the table while they recover from surgery. A lawsuit against someone that is liable for negligence helps many people, not just the person hurt by the negligence. We’ve all seen warnings that you can’t believe had to be printed, like a ridiculous commercial that tells you not try some obviously stupid act at home. It’s all the lawsuits, people think, that made that dumb warning appear. This is a part of the myth of the lawsuit too – do a little research and you’ll usually find that no one ever tried to sue over whatever dumb warning you saw. Generally, they are a part of an overabundance of caution on the part of companies that never bothered to ask a lawyer if they could be sued in the first place. But some warnings do appear because of lawsuits. Like the warning that cigarettes can cause cancer, or that taking too much Tylenol can be fatal. Lawsuits also brought us the fire escape, the seatbelt, and the safety stop on saw blades. When used properly, the lawsuit is a force for good and drives the creation of new technology and new processes that make all Americans safer for decades to come. It isn’t that there aren’t bad lawsuits. There are. Sometimes unhappy people file lawsuits on their own without a lawyer, which is generally a recipe for disaster. Sometimes bad lawyers with bad goals file bad lawsuits. But those lawsuits are the rare headline grabbers that cast a shadow on the good lawsuits, good lawyers, and good people who have been hurt through no fault of their own. If you have been hurt, and know someone else is at fault, don’t let the myth of the bad lawsuit cause you to deny yourself your right of recovery. If you’re a good person, get a good lawyer and get the justice you deserve. If you have any other questions about Personal Injury or Workers’ Compensation lawsuits, please call our Fort Mitchell, Kentucky office at 859-371-5997 or our West Chester, Ohio office at 513-351-5997. We have helped over 3,000 clients and help a new, deserving person every day. We’re Working Hard for the Working Class, and we want to help you!